As Artist in Residence at ACT Campground, David L. Brown will be available to lead photographic tours in the Moab area, including Arches and Canyonlands National Parks and many other scenic areas in the region. An accomplished photographer with thousands of credits to his name, he has traveled on assignment in more than 25 countries as well as every state of the U.S. and most parts of Canada and Mexico. He formerly worked in many formats, including panoramic and large-format view cameras. In the last decade he has moved from film cameras to a digital workflow. 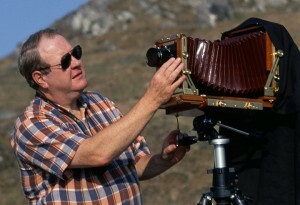 David L. Brown photographing in Utah’s Red Rocks country with a 5×7-inch view camera. He currently works with an all-digital system. Known for his landscape and panoramic images, David’s work has been represented by more than a dozen agents in North America, Europe and the Far East. He is a Life Member of the American Society of Media Photographers and is a member of the North American Nature Photography Association. David is also a writer and editor with a Bachelor of Journalism degree from the top-ranked University of Missouri School of Journalism, where he studied newspaper and magazine editorial and photojournalism. Besides his career as a landscape and travel photographer he has been a newspaper reporter, columnist and editor; magazine editor and publisher; and public relations consultant. David is the author of thousands of news and feature articles and has written seven books. In 2011 he served as President of the Rio Grande Chapter of the Society of Professional Journalists (New Mexico and West Texas). In 2010 he was named Citizen Journalist of the Year in the Top of the Rockies journalism competition held in SPJ’s Region 9 (New Mexico, Colorado, Utah and Wyoming). In 2012 his mystery novel Retirement Man won first place in the mystery, adventure, thriller and suspense category of the annual international competition of SouthWest Writers, a regional organization based in Albuquerque. The category was judged by the executive editor of Penguin Books. Look for David’s special writer’s events to be held at ACT Campground and Learning Center. 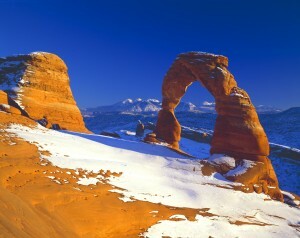 One of the most popular features of Arches National Park is Delicate Arch, here shown after a fresh snowfall. This photo was made by David L. Brown using a 4×5-inch Linhof view camera and Fuji Velvia film. David will be Artist in Residence at A.C.T. Campground, available to lead area photographic outings and provide instruction on how to capture outstanding landscape images. David’s photography has appeared in thousands of advertisements, books, calendars, and many other venues, including use by the following partial list of clients: Reader’s Digest • National Geographic Society • Norwegian Cruise Lines • Rand McNally & Co. • British Airways • Virgin Atlantic Airways • Hallmark Cards • Toyota Lexus Division • Premiere Magazine • Scudder Investment Services • American Automobile Association • U.S. Air • Microsoft Corp. • American Heritage Magazine • Newsweek • U.S. News and World Report • U.S. West • Women’s World • The Boston Globe • The Chicago Tribune • The New York Times • Marathon Oil Co. • Ford Motor Co. • Better Homes & Gardens • Ameritech • Time-Life • City Bank • Pearson Scott Foresman • Pennzoil • Holt Rinehart & Winston • Vogue • American Bar Association • American Management Association • Courtyards of Marriott • Bank One • Agfa • and many more.